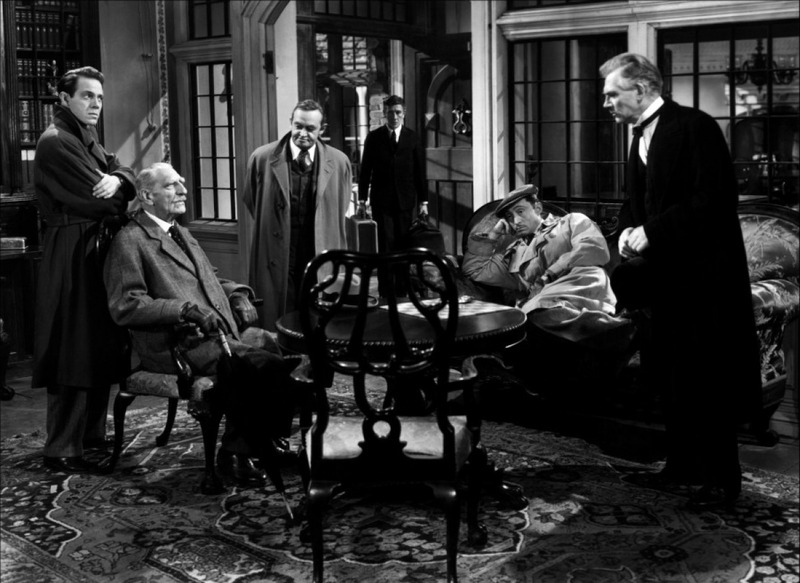 A multiple murder mystery, And Then There Were None adapts the Agatha Christie 1939 novel with a distinct lack of passion. Eight guests assemble at an isolated island off the coast of England, where a single large mansion dominates the landscape. 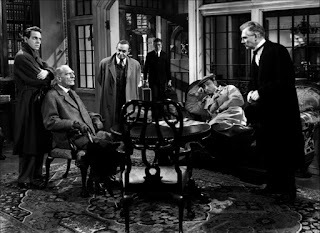 The guests are strangers to each other and include Judge Quincannon (Barry Fitzgerald), Dr. Armstrong (Walter Huston), Philip Lombard (Louis Hayward), Emily Brent (Judith Anderson) and Vera Claythorne (June Duprez). They were all invited to the island by the mysterious Mr. U.N. Owen, who appears to be absent from his own house. Two frazzled servants, Mr. and Mrs. Rogers (Richard Hayn and Queenie Leonard), hired just for the weekend, welcome the guests. Mr. Rogers plays a recording in which Owen accuses each of the assembled guests of being responsible for a crime in which one or more people died. Soon the guests start dying one by one under mysterious circumstances, following the ghoulish Ten Little Indians nursery rhyme. As each death occurs, one of 10 Indian figurines disappears from the dining table centrepiece. The guests search the island to try and find Owen, before realizing the murderer must be one of their own and they start suspecting each other. Directed by René Clair, And Then Were None is functional and methodical, but has aged poorly and never comes close to resonating. While the windswept island and the mazy mansion provide an effective setting, and Christie's source material is strong, the film is devoid of everything else needed to create a compelling cinematic experience. The film settles down to a metronomic routine of roughly one death every eight minutes, and the execution is nothing short of frigid. The film is 97 minutes long, and would have benefitted from a longer length to better delve into the backgrounds of at least some of the assembled guests. Instead, the characters are never developed beyond Clue board game definitions, and they remain cardboard representations. Who dies next is of barely any consequence, because the victims are just about interchangeable and barely introduced before being knocked off. Clair also does not try to inject any level of tension: all the deaths occur off-screen, the bodies are discovered with hardly any sort of reaction, and its quickly on to the next perfunctory and emotionless scene. None of the cast members are provided the opportunity to shine, sharing the screen time in unsatisfactory snippets and defaulting to theatricality in the absence of depth. For audiences unfamiliar with Christie's typical but still ingenious sting in the tale there may be enough interest sustained until the murderer is finally revealed, but for everyone else, the film becomes a test of survival where the sooner everybody dies already, the better.